Stonehenge is one of Great Britain’s greatest ancient ruins. It is a well known Neolithic and Bronze Age stone monument located on Salisbury Plain in Wiltshire, England and spread over 2000 hectares. It is a large stone monument composed of standing stones and earthworks is one of the most famous prehistoric sites in the world. The word Henge refers to a particular type of earthwork of the Neolithic period, typically consisting of a roughly circular or oval shaped bank with an internal ditch surrounding a central flat area of 20 meters or more in diameter. They may contain ritual structures such as stone circles, timber circles, and coves. Archeological evidence indicates that the area around this monument may have been occupied since around 8000BC, but it was during the Neolithic and Bronze Age periods that the vast majority of the monuments around it were built. Early work at this site began in 3000BC when an outer ditch and embankment was constructed, and standing timbers erected. From about 2500BC, Neolithic and Bronze age people started to bring Bluestones and Sarsen stones from Wales and the Marlborough Downs. It was not until 1600BC that this monument was completed. The significance of this monument is under debate and its original purpose is not clear. Most theories suggest that the site may have been built for ceremonial use. Archaeological evidence has indicated that the monument is astronomically aligned, placing particular significance on solstice and equinox. Some have speculated that whether this monument could have been used to predict solar and lunar eclipses points per prehistoric calendar. Some theorists believe that it could have had some spiritual importance and ritual uses for the prehistoric people while others claim that it could have been a sacred burial site for high ranking people from these ancient societies. 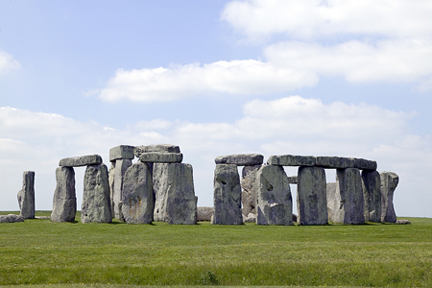 The construction of Stonehenge was an extraordinary engineering accomplishment. The monument that we see today is the final stage that was completed about 3500 years ago. Archaeologists think that the construction of the site was accomplished in three main phases and last final phase. Phase I: The first stage was a huge Neolithic earthwork or Henge, consisting of a ditch, bank, and the Aubrey holes. It was most likely built around 3100 BC. The Aubrey holes are round pits in the chalk, about one meter wide and deep, with steep sides and flat bottoms. They form a circle about 284 feet in diameter. Shortly after this stage this monument was abandoned, left untouched for over 1000 years. Phase II: The construction of the second and most remarkable stage started around 2150 BC. About 82 bluestones from the Preseli Mountains, in south-west Wales were transported to the site. Some stones weighing 4 tons were moved by completing an astonishing journey which covered nearly 240 miles. Once at the site, these stones were set up in the centre to form an incomplete double circle. The original entrance of the circular earthwork was widened and a pair of Heel Stones was erected. The entrance to the semicircle of bluestones is thought to be aligned with the midsummer sunrise. The alignment was continued by the clearing of a new approach to the site, the Avenue, which has ditches and banks on either side like the original outer circle. Phase III: The third stage, around 2000 BC started with the arrival of the Sarsen stones, which were presumably brought from the Marlborough Downs near Avebury, in north Wiltshire, about 25 miles north of this site. The largest of the Sarsen stones transported to Stonehenge weighed 50 tons. 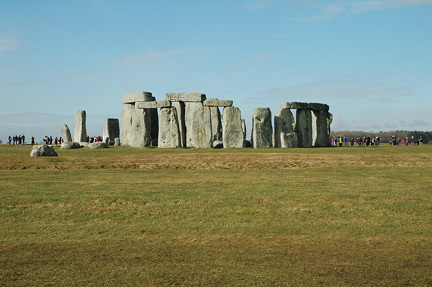 The stones could only have been moved using sledges and ropes. These were arranged in an outer circle with a continuous run of lintels. Inside the circle, five trilithons were placed in a horseshoe arrangement, whose remains we can still see today. Phase IV: The final stage of construction took place soon after 1500 BC when the bluestones were rearranged in the horseshoe and a circle that we see today. The original number of stones in the bluestone circle was probably around 60, these have long since been removed or broken up. Some remain only as stumps below ground level.